As an industry standard, flat-glass films come in 12” increments on the width: 12”, 24”, 36”, 48”, 60”, and the widest 72”. Films can be applied vertically and horizontally, but what can you do when your windows are larger than 72” on the width AND length? In this case, you’ll have to install two separate pieces of film to cover the one window. This is known as ”seaming” or ”splicing” the film. The trick is to do this as cleanly and tightly as possible so you can’t see the line where the films meet. Handling and installing this wide window film can be tricky. But with the right tools and an extra set of hands it will go much smoother. All the films on the right are available in 72” wide. This wide window film is one of the most popular as well for homes. Before you do any actual cutting, you should consider where to place the seam on the window. You will usually have options when deciding: do you want it vertical or horizontal? Higher or lower? It may depend on the width of the roll you are working with, but generally you’ll want to place it where it is least noticable. 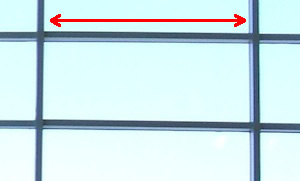 If you have tall windows, placing it at the top will make it harder to see. If it is darker at the bottom or people tend to look toward the top more often, then placing it at the bottom will be the best method. The second factor to consider when doing this technique properly is the cutting. Some customers try to cut the two pieces as true as possible with a straight-edge, then line them up and install. Or, they make sure to use the factory edges of the film when ”butting” the two ends together. This can work well, but most times it is difficult to cut the film perfectly straight, or using the factory edges creates too much waste. The best method to splicing is to overlap the two pieces about 1/2” where they meet. Install the entirety of the pieces, then use a sharp blade to cut down the center of the overlap. Since the pieces are installed and adhere firm on the window, they shouldn’t move or peel while you are slicing. Remove the sliced strips of film and you are left with a tight seam.